La Musique Nouveau. The New Music. A bold statement of intent. Particularly so, given The Dunes’ chosen genre. The often potentially confining sand-box of dream pop / dream gaze has historically allowed little in the way of innovation or experimentation. So does the Adelaide band’s third EP live up to the promise of its title? Opening track ‘Red Leaves’ reminds the listener immediately of the genre’s luminaries (Mazzy Star, Cocteau Twins, et. al.) and deviates marginally from the band’s earlier output – perhaps a clever ploy to ease the listener in for the ride ahead. The song’s airy and distant percussion, courtesy of Dan Fernie-Harper, sits near the top of a heavy mix, which unfortunately at times obscures the bass performance. All of the song’s elements combine to create a track with nary a component on which to latch; even Stacie Reeves’ reverb-bathed vocals feel less like a focal point and more like another blanket of sound. The song is a smoky haze of soundscape and texture – two nouns synonymous with this style of music. It’s a safe start, following on from The Dunes’ last release (2012′s Between Midnight and Dawn). ‘Blue Lake’ abandons rhythm guitar and it’s left to Adam Vanderwerf’s effortlessly fluid bass playing to hold the piece together. The track’s other elements (a lush mix of vocals, understated percussion, cello and lead guitar) become less concrete on this song – no longer providing a diffuse foundation, they now accompany one another, centre-stage on equal terms. Channelling Wish-era Cure, ‘Post Office Rock’ introduces intriguing, crisper textures into the EP’s mix. The palette of sound chosen here is of a more pure variety, the most interesting components of which are two cello solos (performed by Xavi Nou) in the latter half of the track, which seem to defy gravity with their movement and headphones are a must. Deceptively simple-sounding, this song, coloured with a goth-rock hue, is quite beautiful. There’s a bluesy, noisy, post-punk swagger to ‘A Thousand Crimes’, which helps to make it the most surprising song on offer. The track sees principal songwriter and guitarist Matt Reiner stretching himself more-so than at any other time on La Musique Nouveau. Reeves delivers her best Siouxsie monotone. Her distorted vocals, able to breathe without the weight of the thick, rich effects in which they are immersed elsewhere on the EP, sound free. The track must surely constitute a feature of the band’s live show. To close La Musique Nouveau, Reiner draws once again from the genre’s blueprint. This amounts to an irrelevancy, however, as ‘Interplay’ is the EP’s highlight. At over 8 minutes in length it’s quite a journey, washing over the listener in two passages. The extended outro, featuring layered vocals, organ and a pounding-yet-distant crash cymbal, culminates in a swell of beautiful noise; every second is vital. Some gorgeously poetic lyrics help to seal the deal – “You used to speak to me in triplets / Now there’s silence on the page / …between us, there is no interplay”. The production and mixing across the E.P. is more varied than on the band’s last release, making it a more diverse listen. This is particularly so when it comes to the vocals on La Musique Nouveau. Having divergent styles from track to track does work in its favour, however, as an E.P. with only five songs on offer, the barest hint of a lack of cohesion creeps in. After three shorter releases from the band, the concept of a full-length from The Dunes is exciting. One senses that with the scope to experiment that comes with writing for an album, Reiner and company could create something alluring, adventurous and unified. La Musique Nouveau is compelling. The EP certainly lives up to its title – a stylistic progression from the band’s previous release. The fact that the band is prepared to evolve so readily at such an early point in its career speaks volumes. Where lands The Dunes’ next footfall will be even more telling. 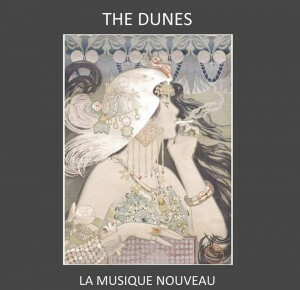 This entry was posted in Arts, Music and tagged adelaide, dreampop, EP, La Musicue Nouveau, lipmag, music, Review, the dunes. Bookmark the permalink.